In this new century, a rising proportion of the world’s societal wars are ending not in victory for one side but in stalemate and negotiated peace, outside military intervention, or both, as events in Afghanistan, Bosnia and Herzegovina, East Timor, and Sierra Leone have borne witness. Additionally, a rising number of soldiers, police officers, and other personnel from the international community have helped war-damaged lands regain their footing through peace operations run by the United Nations, NATO, and other organizations. After ten years of sustained effort, what has been accomplished and what lessons have been learned? 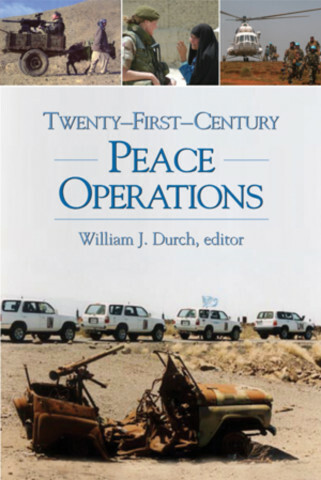 This volume, the third in a sequence on peacekeeping and post-conflict security edited by William J. Durch, addresses these questions through focused, structured case studies of operations in the above four countries, the Democratic Republic of the Congo, and Kosovo. The common structure walks the reader into and through the problems that have driven each conflict and the solutions derived to deal with them. The focus is on how peace operations work and why they succeed, fail, drift, or recover. The editor and case authors provide constructive and practical guidance for future operations, anticipating how international peace support, its objectives, and its participants may change in the years ahead. This accessible, insightful, and superbly edited volume is sure to be widely read by scholars, analysts, and practitioners alike—and will no doubt be regarded as the single most important source for data on and analysis of these important missions. Twenty-first Century Peace Operations is a joint publication of the Henry L. Stimson Center and the United States Institute of Peace.